Yes, and every time a container — can or otherwise — gets a little smaller, it seems as though the price goes up. It’s such a phenomenon that Blue Bell, our famous ice cream maker, prints on every carton “Still a Half Gallon!” In an age of the marvelous shrinking ice cream “pint,” it’s a good marketing tool. I love it. It’s amazing how just staying the same is worthy of note in this age of shrinking food containers. I’ve seen recipes with those can designations but never knew what to make of them. Thanks for explaining and for the table. It’s nice to hear that you found this post helpful. Cans as well as other packaging are definitely getting smaller as prices continue to rise. Some things defy logic. It doesn’t seem like prices should go up when the containers get smaller. Good observations. I remember when the yogurt containers went down from 8 oz to 6 oz. I was furious, but no one else seemed to care. I have a couple of cake recipes that called for one 8 oz container of yogurt… which now I just short out… because I’m a rebel. As long as the recipe still turns out okay, it makes sense to be a rebel. I have noticed that with my recipes. Cereal boxes are getting smaller too. Sometimes it seems like almost all packaged goods are getting smaller. The yogurt I bought the other day was 5 1/2 ounces! Ah! That’s why it is not a complete lunch! I do remember when I was a kid, my mother referred to most of the cans of vegetables as #2 cans. I don’t remember any other number attributed to the size of the cans. Whew, some of the yogurt containers are really small. These days I often just buy the large packages of yogurt and scoop out what I want. That’s what I usually do. too! I buy a local Greek style yoghurt, plain and non-fat, but it is so delicious it almost tastes like cream! I buy it by the quart and it is handy for everything from a snack to a sauce. My granddaughter loves the sweetened ones, so now and then she’ll get a treat. Going down: I still get recipes that mention a #2 can. But weights can be very different now. What used to be 16 oz. Is now 12 oz. Same price or higher. Going Up: I wonder if dress sizes are different now too…seems like people were smaller 100 years ago. A size 14 is probably labeled a 16 now since we are bigger and bigger. Mind boggling! I notice in England that we are being flattered by current dress sizes. I’m the size I was when I was 18. Then I was a 12. 50 years later – lo and behold, I’m a 10. I remember seeing recipes that specified a can size by number. I hope most recipes have weights now, since that is easy to find on the can. 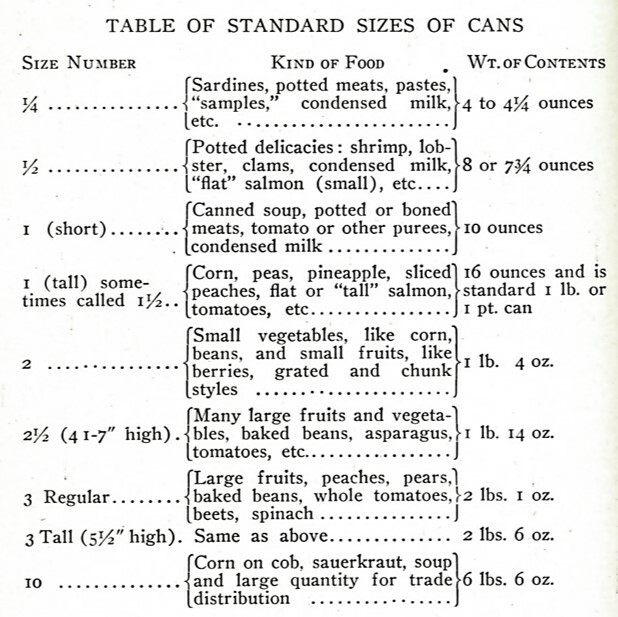 I think the use of can numbers in recipes peaked by mid-20th century. That was when my interest in cooking started! That is fascinating to learn. I want the numbers back! This probably is wishful thinking but if cans had numbers, maybe they’d stay the same size over time. I didn’t realize that they had changed as much as what you have noticed. Kind of makes me mad. Good idea – It makes a lot of sense to add notes to your recipes about the meaning of the can sizes. So true. Who would think to call a can by a number? And we also notice the shrinking package with the same or higher price. 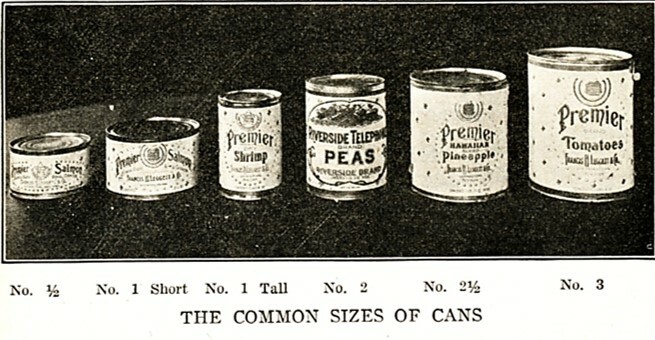 Calling a can by a number suggests that they had a very high level of standardization back then. This was a time period when things were rapidly industrializing and when people were into “scientific” housekeeping. That is a good point. Efficiency studies were popular. True the cans are often smaller. A little while back I was looking for canned tuna to discover in wasn’t in cans but little bags! On the positive side, those little amounts are just right for a smaller family. I know that some of my friends prefer the little bags of tuna – but I’m enough of a traditionalist that I still like the cans. I think it is rather sneaky the way manufacturers decrease sizes bit by bit. I like the idea of recognizable standard sizing. Seems like a fairer way to do things. I agree – today size seems to just change bit by bit at the whim of the manufacturer. Yes, manufacturers are changing packaging sizes on most, if not all, food products. No biggy (pun intended) but sometimes it requires some adjustments to a recipe. It sometimes feels like a biggy to me when packaging sizes are substantive enough that I need to adjust a recipe.